Electrocardiography is a method of the graphics Desk potential difference electric field of heart arising from its activities. The registration is performed using the apparatus of the electrocardiograph. It consists of an amplifier that allows to capture currents of very low voltage; galvanometer, measuring the voltage; power systems; recorder; electrodes and wires, connecting patients with the device. Recorded curve is called an electrocardiogram (ECG). Registration of potential difference of the electric field of the heart from two points of the body is called abstraction. As a rule, ECG recorded in the twelve-lead: three - pole (three standard lead) and nine - SPST (single-pole three-enhanced discharge from limbs and 6 single pole breast derivations). When bipolar leads to the electrocardiograph connected by two electrodes, a unipolar leads one electrode (indifferent) is United, and the second (differently, active) is placed at selected points of the body. If the active electrode placed on a limb, abstraction called a single-pole, increased from limb; if this electrode is placed on the chest is a single - pole breast abstraction. For ECG registration in the standard leads (I, II and III) on a limb impose a cloth napkin, moistened with physiological solution, which put a metal plate electrodes. One electrode with red wire and one relief ring is placed on the right forearm, the second - with the yellow wire and two relief rings on the left forearm and the third - with the green wire and three relief rings on the left Shin. For registration leads to the electrocardiograph in turn connected by two electrodes. For the record I lead connect the electrodes to the right and left hand, lead II - electrodes right hand and left foot, III lead - electrodes left hand and left leg. Switching leads is made by turning the handle. In addition to the standard, off the limbs off unipolar reinforced lead. If the active electrode is located on the right hand, abstraction is designated as the aVR or pack, if on the left hand - aVL or street, and if on the left leg - aVF or University. Fig. 1. The location of the electrodes at the front Desk chest leads (indicated by the digits corresponding to their serial 1 of the rooms). Vertical strip crossing the figures correspond anatomical lines: 1 - right sternal; 2 - the left sternal; 3 - left okolovrusno; 4-left srednesrochnoi; 5-left anterior axillary; 6 - the middle left armpit. When registering unipolar chest leads active electrode placed on the chest. 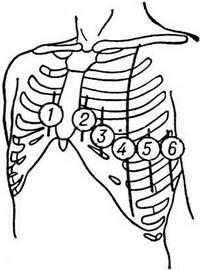 ECG recorded in the following six positions electrode: 1) the right edge of a breast bone in the IV intercostal space; 2) at the left sternal border in the IV intercostal space; 3) on the left okolovrusno line between IV and V intercostal space; 4) srednesrochnoi line in the fifth intercostal space; 5) on the anterior axillary line in the fifth intercostal space and 6) in the mid-axillary line in the fifth intercostal space (Fig. 1). Single pole chest leads indicate letter V Latin or Russian. Rarely register bipolar chest leads, in which one electrode was placed on the chest and the other on his right hand or left leg. If the second electrode was located on the right hand, chest leads meant Latin letters CR or Russian - GP; at the location of the second electrode on the left leg chest leads meant Latin letters CF or Russian - GN. ECG healthy people is variability. It depends on the age, body, etc. But in norm it is always possible to distinguish certain teeth and intervals, reflecting the sequence of excitation of the heart muscle (Fig. 2). 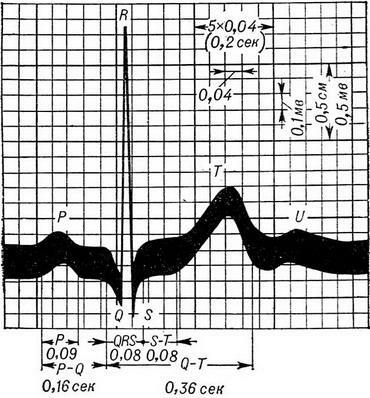 According to the available time stamp (photo paper distance between the two vertical stripes equal to 0.05 sec., on graph paper when driving speed of 50 mm/sec 1 mm 0,02 sec., at a speed of 25 mm/sec - 0,04 seconds) you can calculate the length of splines and intervals (segments) of the ECG. The height of teeth compared with the standard mark (when applying to the device pulse voltage of 1 mV registered the line should deviate from the original position 1 cm). Excitation attack begins with the Atria, and ECG appears atrial prong R. In norm it is small: the height is 1-2 mm and a length of 0,08-0,1 sec. The distance from the beginning, and P wave to zubza Q (interval P-Q) corresponds to the time of propagation of an excitation from the Atria to the ventricles and equal to 0.12-0.2 sec. During ventricular excitation records the QRS complex, and the amount of his teeth in different leads expressed differently: the duration of the QRS complex - 0,06 - 0,1 sec. The distance from the tooth S till the beginning of the T wave - segment S-T, the norm is located on one level with an interval P - Q and offset it should not exceed 1 mm, With the extinction of excitation in the ventricles is written prong So the Interval from the start of Q-wave till the end of the T wave reflects the process of excitation of the ventricles (the electric systole). Its duration depends on the frequency of heart rhythm: with the increased rhythm he shortened, with slow - extended (on average it is equal to 0.24-0,55 sec.). A heart rate easily calculate ECG, knowing how much time does one cardiac cycle (the distance between the two prongs R) and how many such cycles is contained in a minute. The interval T - R corresponds diastole heart, the device at this time writes straight (so-called isoelectric line. Sometimes after the T wave is logged U waves, the origin of which is not clear. Fig. 2. Electrocardiogram healthy person. In pathology value of teeth, their duration and direction, as well as the duration and location of intervals (segments) ECG, may change significantly, which allows to use electrocardiography in the diagnosis of many diseases of the heart. Using electrocardiography diagnosed various violations heart rhythm (see Arrhythmias), ECG reflected inflammatory and degenerative disorders of the myocardium. It is particularly important electrocardiography in the diagnosis of coronary and myocardial infarction. ECG possible to determine not only the presence of a heart attack, but also to find out what the wall of the heart affected. In recent years, to study the potential of the electric field of the heart method telesecretary (Radioelektronika), based on the principle of a wireless transmission of the electric field of the heart by means of a radio transmitter. This method allows you to register ECG during exercise, in movement (in athletes, pilots, astronauts). Electrocardiography (gr. kardia - heart, grapho - writing, recording) is a method of registration of electrical phenomena arising in the heart during its reduction. in carved heart. Du Bois-Reymond (E. Dubois-Reymond, 1848) proved and nerves and muscles excited part of electronegative in relation to being alone. Cellier and Mueller (A. Kolliker, N. Muller, 1855), imposing on the cutting heart neuromuscular preparation of a frog, consisting of the sciatic nerve, United with a calf, received during contraction of the heart double reduction: one at the beginning of systole and other (non-permanent) in early diastole. Thus was first registered electromotive force (EMF) of the naked heart. To register EMF heart from the surface of the human body for the first time managed to Waller (A. D. Waller, 1887) by capillary electrometer. Waller believed that the human body is a conductor surrounding the source of EMF - heart; different points of the human body have the potentials of various sizes (Fig. 1). However, the resulting capillary electrometer record EMF heart accurately reproduced its fluctuations. Fig. 1. The scheme of distribution of isopotential lines on the surface of the human body, due to the electromotive force of the heart. Numbers denote the values of potentials. The exact record EMF heart from the surface of the human body is an electrocardiogram (ECG) - was produced by Antivenom (W. Einthoven, 1903) via a string galvanometer, built on the principle of apparatus for receiving transatlantic cables. According to modern concepts cells excitable tissues, in particular, the cells of the myocardium, covered with a semi-permeable membrane (diaphragm), permeability to potassium ions and impervious to anions. Charged positive ions of potassium, which is in excess in the cells compared with their environment, held on the outer surface of the membrane negatively charged anions, located on its inner surface impervious to them. Thus the shell of the living cells is a double electric layer of the shell is polarized, with outer surface of her positively charged against internal content, negatively charged. This transverse potential difference is the resting potential. If the external and internal sides polarized membrane to make microelectrodes, in external circuit occurs the current. Write the resulting potential difference gives monophasic curve. When an excitation membrane excited loses the plot polonoroeste, depolarized and its surface becomes electronegative. Registration of two microelectrodes potentials outer and inner shell depolarized membrane also gives monophasic curve. Due to the potential difference between the surface excited depolarized plot and the surface of polarized at rest, there is a current actions - the action potential. When the excitement covers all the muscle fiber, its surface becomes electronegative. Termination of excitation causes a wave of depolarization, and restored the building peace muscle fibers (Fig. 2). Fig. 2. Schematic illustration of the polarization of depolarization and repolarization cells. If the cage is at rest (1), on both sides of the cell membrane notes electrostatic equilibrium, consisting in the fact that the surface of the cell is electrobiological (+) in relation to its inner side (-). Wave excitation (2) immediately disturbs this balance, and the cell surface becomes electronegative in relation to its inner side; this phenomenon is called depolarization or, more correctly, inversion polarization. After the excitement was around the muscle fiber, it becomes completely depositional (3); the whole surface has the same negative potential. This new balance will not continue for long, as wave after wave excitation should wave of depolarization (4), which restores the polarization state of rest (5). The process of excitation in normal human heart - depolarization - is as follows. Emerging in the sinus node, located in the right atrium, the excitation wave propagates with the speed of 800-1000 mm in 1 sec. like rays of the muscle bundles first right and then the left atrium. The duration of the coverage of the excitation of both Atria 0,08-0,11 sec. First 0,02 - 0,03 sec. instituted only the right atrium, then 0,04 - 0,06 sec.- both atrial and last 0,02 - 0,03 sec.- only the left atrium. On reaching the atrioventricular node distribution of excitation of slowing down. Then, with a large and increasing speed from 1400 to 4000 mm in 1 sec.) it shall be sent by the bundle of his, his legs, their branches and branches, and achieves the ultimate endings and wiring systems. Reaching the contractile myocardium, agitation with a much reduced speed (300-400 mm in 1 sec.) spreads on both ventricles. As peripheral branching and wiring systems scattered mainly under the endocardium, before just come in excitement inner surface of the heart muscle. The further course of ventricular excitation is not associated with the anatomical location of the muscle fibers, and is directed from the inner surface of the heart to the outside. The time of excitation in muscle bundles, located on the surface of the heart (subepicardial), is determined by two factors: time of excitation are closest to these bundles of branches and wiring systems and thick muscular layer, separating subepicardial muscle bundles from peripheral branches and wiring systems. Before all excited interventricular septum and right papillary muscle. In the right ventricle excitation first covers the surface of its Central part, since muscle wall in this place thin and muscular layers closely in contact with peripheral ramifications right leg and wiring systems. In the left ventricle, first of all comes to the initiation of the tip, because the wall separating it from the peripheral branches of the left leg, thin. For various points of the surface of the right and left ventricles normal hearts period of excitation occurs at a certain time, and ahead of all comes to the initiation of most of the fibers on the surface of a thin wall of the right ventricle and only a small number of fibres on the surface of the left ventricle due to their proximity to the peripheral branches and wiring of the system (Fig. 3). Fig. 3. Schematic representation of normal excitation interventricular septum and external walls of the ventricles (Sodi-Pallares with labour). Stimulation of ventricles begins on the left side of the walls in the middle part (0,00 - 0,01 sec.) and then can reach the base of the right papillary muscles (0,02 sec.). After that excited subendocardialnah muscular layers of the outer wall of the left one (0.03 sec) and right (0,04 seconds) the ventricles. The latter initiated the basal part of the outer walls of the ventricles (0,05-0,09 sec.). The termination process of excitation of the muscle fibers of the heart - repolarisation - would not be fully explored. The repolarization fibrillation coincides largely with the process ventricular depolarization and partly with the process of their depolarization. The process of ventricular repolarization is much slower and in a slightly different sequence than the process of depolarization. The reason is that the duration of excitation muscle bundles surface layers of the myocardium shorter than the duration of excitation subendocardialnah fibers and papillary muscles. The recording process of depolarization and repolarization of the Atria and ventricles with the human body surface and gives a characteristic curve - ECG, reflecting the electric systole heart. Record EMF heart is currently produced in several other methods, what were registered by Antivenom. Einthoven registered current, resulting from connecting two points on the surface of the human body. Modern vehicles - electrocardiographs - register directly voltage, due to the electromotive force of the heart. The tension caused by heart, equal 1-2 mV, enhanced by the radio tubes, semi-conductor, or cathode ray tube to 3-6 In, depending on the amplifier and recording device. The sensitivity of the measuring system is set so that the potential difference of 1 mV gave the deviation of 1 see recording on a photographic paper or film or directly on the paper (chernilnikova, with thermal record, with jet account). The most accurate results give account on photographic paper or film and inkjet record. To explain the peculiar form ECG were various theories proposed its Genesis. A. F. Samoilov considered ECG as a result of interaction of two monophasic curves. Given that the registration of two microelectrodes the inner and outer surface of the membrane in the States of calm, excitation and damage it turns out monophasic curve, MT Udeleno believes that monophasic curve shows the main form of bioelectric activity of the myocardium. The algebraic sum of two monophasic curves gives the ECG. Pathological ECG changes due to shifts monophasic curves. This theory of the Genesis of the ECG is called differential. The outer surface of the cell membrane in the period of excitation can be represented schematically as consisting of two poles: negative and positive. Immediately before the wave excitation in any place of its distribution in the surface cells is electrobiological (state of polarization at rest), and directly after wave excitation of the surface of the cells is electronegative (status depolarization; Fig. 4). Data electrical charges of opposite signs, grouped in pairs, one on each side of the space covered by the wave of excitement, form an electrical dipoles (a). Repolarization also creates an incalculable number of dipoles, but, unlike the above dipoles, negative pole is located at the front and the positive pole - back in relation to the direction of propagation of wave (b). If depolarization or repolarization completed, the surface of all cells has the same potential (negative or positive); dipoles are completely absent (see Fig. 2, 3 and 5). Fig. 4. Schematic representation of electric dipoles in depolarization and repolarization (b)arising from both sides of wave excitation and waves repolarization changes in electrical potential on the surface of the fibers of the myocardium. Fig. 5. The scheme of an equilateral triangle on Einthoven, Faro and Adapted. The muscle fiber is a small two-pole generator, producing a small (elementary) EMF - elementary dipole. In every moment systolic heart is depolarization and repolarization huge number of myocardial fibers, located in different parts of the heart. The sum of the formed elementary dipoles creates the appropriate magnitude of the EMF heart at every moment systole. Thus, the heart is a total dipole that change during the cardiac cycle the magnitude and direction, but do not change the location of its centre. The potential in different points on the surface of the human body has a different value depending on the location of the total dipole. The sign of the potential depends on which side of the line perpendicular to the axis of the dipole and conducted through its center, is located this point: on the side of positive potential has a +sign, and on the opposite side of the sign. Most of the time of excitation of the heart the surface of the right half of the body, of the right hand, head and neck has a negative potential, and the surface of the left half of the body, legs and left arm - positive (Fig. 1). This is a schematic explanation of the Genesis ECG according to the theory of the dipole. EMF heart for electric systole is changing not only the magnitude but also the direction; therefore, it is a vector quantity. The vector is represented by a straight line of a certain length, the amount of which under certain data recording apparatus indicates the absolute value of the vector. The arrow on the end of the vector indicates the direction EMF heart. Occurred simultaneously vectors EMF individual fibers of the heart summarizes the rule of addition of vectors. Total (integrated) vector of two vectors are parallel and directed in one direction is equal to the absolute value of the sum of its constituent vectors and is aimed in the same direction. The total vector of two vectors of equal size, placed parallel to and directed in the opposite side of 0. The total vector of two vectors directed to each other at an angle equal to the diagonal of a parallelogram, built from components of its vectors. If both vector form a sharp angle, their total vector pointing towards the components of its vectors and more than any of them. If both vector form an obtuse angle and, consequently, in opposite directions, their total vector pointing towards the greatest vector and shorter. Vector analysis ECG is to define the teeth ECG spatial direction and value of the total EMF of the heart at any moment of its excitation.